Before entering Edmund Clark’s exhibition, The Day the Music Died, you hear Don McLean’s “American Pie” playing from the bottom of the stairs. Descend into the basement and turn left. There’s a plainly printed list of twenty-four tracks ranging from “Can You Tell Me How to Get to Sesame Street” to “Enter Sandman” by Metallica. The black text is arranged cleanly and uniformly on the white wall. The piece, American Pie, lists the songs American soldiers played on repeat to torture prisoners disappeared to Guantanamo Bay. Edmund Clark is a British photojournalist whose most recent work explores the visual representation of the War on Terror. 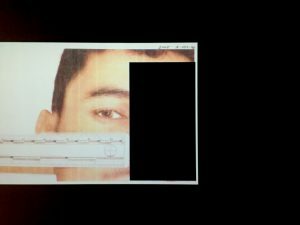 For nearly a decade, he collaborated with counterterrorism investigators to build an archive of photographs and documents. The results show systems that operate locally and globally, using small, private businesses to facilitate the tactics of extraordinary rendition and enhanced interrogation used by the CIA over the last two decades. The Day the Music Died, Clark’s first solo exhibition in the United States, presents eight series of found images, photographs, and videos. The exhibit shows the war taking place not in the desert landscapes of cities reduced to rubble but here, in small American businesses and suburban outposts of Europe. It gives us a new way of looking at a war that has been visualized repeatedly – a new way of understanding the how it has incontrovertibly affected and been affected by visual culture. Consider the rectangular room in the center of the gallery. The piece is Body Politic. 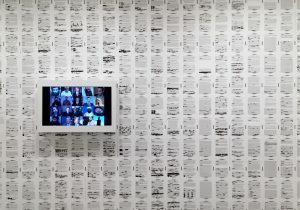 The four-walled structure is wallpapered with pages of the Committee Study of the CIA’s Detention and Interrogation Program and the Special Report, Counterterrorism, Detention and Interrogation Activities. Against the black and white backdrop, we see full color videos of politicians, terrorists, and prisoners, some more recognizable than others, addressing us through the screen. They are the faces of the global war, the mouthpieces of the two sides that have been established – Western leaders, Barack Obama, George W. Bush, and Tony Blair lumped, non-hierarchically with the faces of what Bush once called the axis of evil: Osama Bin Laden, Saddam Hussein, Muammar Gaddafi, and others. They mouth words, but no sounds come out. Clark proposes a metaphor for the meaninglessness of the official story. Move closer. Perhaps if we look behind the screen, the reports will show a complete story. From Body Politic. Image via author. Clark demonstrates that the text of the reports is limited as well. Black rectangles starkly mark redacted portions of the sentences and paragraphs that detail the interrogation techniques used on prisoners from the other side at Guantanamo. Clark presents the official report as he first saw it, censored by those who released it. As the video is incomplete for the lack of sound, the text is equally fragmented by the information obscured from us. The interrogation and detention techniques described are only a fragment of a larger story. The people on the screen, even those you trust, aren’t going to tell it to you. Body Politic questions the mainstream narrative. It levels representatives from Western governments with the leaders of majority-Muslim countries that have been established as their enemies. The photos of Bin Laden and Saddam Hussein remind us of their crimes, but the documents on the wall remind us that American and European leaders have broken laws as well, violating the Geneva Convention and Human Rights sanctions in the process of seeking information. The piece reconsiders the frame of an “axis of evil” against an “axis of good” and points to the people who suffer in the reported story. There are certain images we instinctively associate with the War on Terror. They’re usually set in unnamed towns in the Middle East or North Africa. American soldiers dressed in sand-colored camouflage wear helmets, bulletproof vests, and goggles. They carry assault rifles and machine guns. The enemies are brown skinned and bearded. They burn American flags. They carry similar guns. These are not the photographs Clark shows us. He depicts the war by looking at the places, objects, and documents that we are meant to believe are on the peripheries of the battle. On one wall, he assembles a collection of documents, framed and hung. We see the emails from the small commercial airline that flew disappeared detainees from their homes in North Africa, the Middle East, and South Asia to black sites in Lithuania, Romania, and Thailand and to the prison at Guantanamo. Emails describe how pilots at the company are concerned with the “media attention” their flights received, that they no longer feel safe carrying out the orders associated with their government contract. From 198/2000. Image via author. In a glass case that juts out at hip level we see photos of that same commercial airline’s office building. There are photos of the pilots’ houses. The image of the house is abstracted by Clark who pixelates fragments of his photos, reducing them to monochrome squares of color that hint to the larger photo without revealing its content. Photos of Qatari mosques and European hotel rooms and nondescript buildings hidden behind trees in dense forests mark the trail of a war occurring somewhere familiar. A war happening over Yahoo emails in Brutalist office buildings. In the clean, black rectangles of redacted text in official reports. Clark never delineates a clear protagonist and antagonist. When he turns his lens from the processes to the realities of detention and interrogation, he looks to the spaces that define individual experiences of the conflict rather than photographing soldiers in combat. In the series Guantanamo: If the Light Goes Out, Clark contrasts the detainees cells in the Cuban prison with those of the American soldiers who ran it. The impersonality of sterile, white surfaces in a nondescript white cell furnished only with a regulation blue blanket is contrasted with the cluttered room of an American guard whose bed is covered in a quilt decorated with the American flag. A photo of the regulation white scrubs, sneakers, and towel compared to the scattered belongings of the officer whose brown flip flops, camouflage duffel bag, and bright, off-duty clothes are strewn on the floor. The images of the prison are contrasted with images of the houses detainees returned to when they were freed. Without ever showing a human figure, Clark conveys a universal understood concept of home. Rooms with brightly lit windows, flowers, bright Oriental rugs, and plastic children toys remind us that these detainees had homes and lives before they were confined to empty rooms for crimes they were never tried for. That they decorated those homes the same way an American soldier might decorate his or her room when stationed at Guantanamo. Circling the gallery, you see you can enter Body Politic through a dark doorway you might have overlooked. The room is unlit. Silent. On each of the four walls, images flash of injured bodies. These are the only human figures in the exhibition. 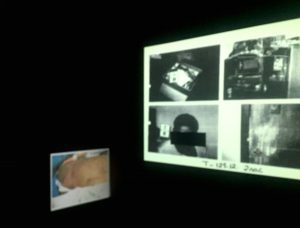 The piece, 198/2000, shows the less than two hundred images of two thousand that the CIA released of abuse at Abu Ghraib. They show the bruises, cuts, and sprains left behind from questioning. They are only 9.9% of the story. In this dark room,we still see only fragments of the bodies of those affected by what the government calls extraordinary rendition and enhanced interrogation. Looking at the photos, they might be better understood as disappearance and torture. Brown skinned men are reduced to their injured, broken bodies, distanced from the indicators that allow Western audiences to see them as terrorists. Their eyes are covered by the same black rectangle we saw on the documents outside. Of the 198 photos, some are completely redacted. The work offers a more human image than any other piece, but it is still incomplete. Like so much else in this exhibition, the full story is withheld. Clark’s exhibition is fundamentally shaped by the limitations placed on what we can and cannot see. If we know 198/2000 shows images of abuse perpetrated by the American government, we are held accountable to push further, to work harder for justice. To uncover what is depicted in the 1,802 images we are not shown rather than leaving it up to the imagination. In showing us the unseen aspects of the War on Terror, Clark asks us to question how it has been represented to us. Why is it shocking that the war is not isolated to foreign soil? That it takes place in familiar landscapes? Maybe it’s for the same reason that the whisper of American Pie following you up the staircase as you leave the exhibition is so haunting. For the same reason that as a Muslim growing up in an America at war with the concept of terror, it is shocking to see that terrorists look more like you than the leaders telling you why we’re going to war. It is easier to distance the truth of the war we continue to fight 16 years after it began, to export it to the bleakness of the desert, to civilizations that we’re told were only important in ancient times. Looking at Clark’s exhibition, we see how easily Western culture can be subverted. How its indicators can be charged with violent meaning. How the familiar becomes strange when we see it through a different lens. Edmund Clark’s The Day the Music Died is on view at the International Center for Photography in New York through May 6, 2018.